AFTER becoming the first man to run in 250 Parkruns, Jim Clinton says his next goal is to reach the 500 marker. The North Belfast native reached the significant milestone on Saturday morning at the Waterworks. After posting a time of 22.26 – seven seconds off his Waterworks personal best – Clinton became the first person in Ireland to complete in 250 Parkruns but he has already set his sights on bigger goals. 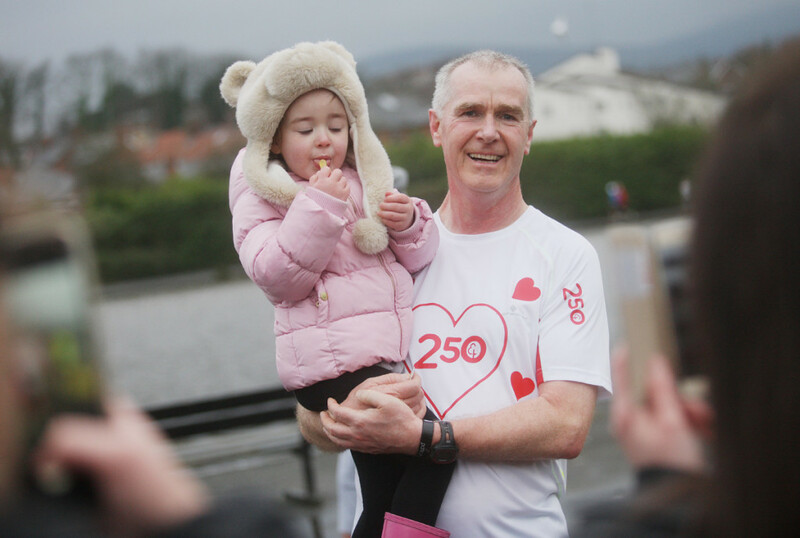 “Having been the first person to reach 250 Parkruns in Ireland, I would like to go onto the next milestone and be the first person in Ireland to do 500 Parkruns, 10 years of running every Saturday morning,” said Clinton. Prior to Saturday’s run, the man dubbed ‘Parkrun Jim’ was in demand for various media interviews. He admits that the attention made him a little nervous as he set off on the 5K run around the familiar settings of the Waterworks and says the venue was the ideal place to complete his 250th Parkrun. “My time for the 250th run was 22.46 and it was a good time for me. I paced around with my good friends Gerard McNamara and Roisin Hughes from the North Belfast Harriers,” said Clinton. “I can honestly say I was very nervous before the race and there was little sleep on the Friday night. “Newspapers, radio and social media were a big part of the build up to Saturday. The attention the Parkrun got was excellent and, of course, I enjoyed the hype. “Waterworks is the home of Parkrun in Ireland. There was no question of doing it anywhere else. “It was very important that the Waterworks got to host the first 250 Parkrun in Ireland. Clinton’s dedication to the Parkruns once resulted in him flying home from a family holiday in Spain to take part in a run in Falls Park before returning to his family the next day. However, the North Belfast native wasn’t always so committed to looking after his health and wellbeing. “A number of years ago, I had put on a lot of weight reaching 16st 7lb at one point,” revealed Clinton. “Exercise started with walking and jogging. The Parkruns then came to Ireland and after doing one I was hooked. Because of Parkruns and running in general, I have been able to maintain my current weight (between 13st and 13st 7lb) for over five years. “My unofficial role now is to get as many people to get active and fit. I am convinced of the benefits to both physical and mental health through running. “I never took part in any sport until I was almost 50 years of age. “In the past five years, because of taking the plunge and registering for Parkrun, I have went on to do 10K, half marathons and numerous full marathons. He added: “If someone who never took part in any sport until the age of 50 can do it, anyone can. “The good thing about running is that you can fit it in when you are not busy with work or home life.